Haggis is a tradtional Scottish dish containing sheep's offal (heart, liver and lungs), minced with onion, oatmeal, suet, spices, and salt, mixed with stock, and traditionally simmered in the animal's stomach for approximately three hours (although nowadays haggis tends to be simmered in a casing rather than the stomach). It is often considered to be the national dish of Scotland, and is memorialised in Robert Burns' poem Address to a Haggis. Originally a modest dish ensuring no part of the sheep goes to waste, haggis can now be found on the menu in most pubs and many restaurants where one can encounter it in anything from Filo pastry, to Drambuie sauce, to the haggis, neeps and tatties roulade on sale at the Scottish Parliament’s Holyrood cafe. Furthermore, some supermarkets have been known to sell products which are not sheep based. This is very wrong! A vegetarian version is now also available and while still ‘wrong’, is quite tasty! Haggis is traditionally served with mashed neeps (turnips) and mashed tatties (potatoes). While it is eaten all year round, haggis is particularly associated with Burns Night, when it is traditionally served with "neeps and tatties" (Scots: swede, yellow turnip or rutabaga and potatoes, boiled and mashed separately) and a "dram" (i.e. a glass of Scotch whisky). 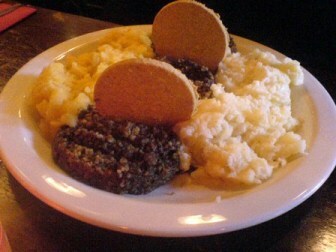 Mashed together, "neeps and tatties" is also known as "clapshot".